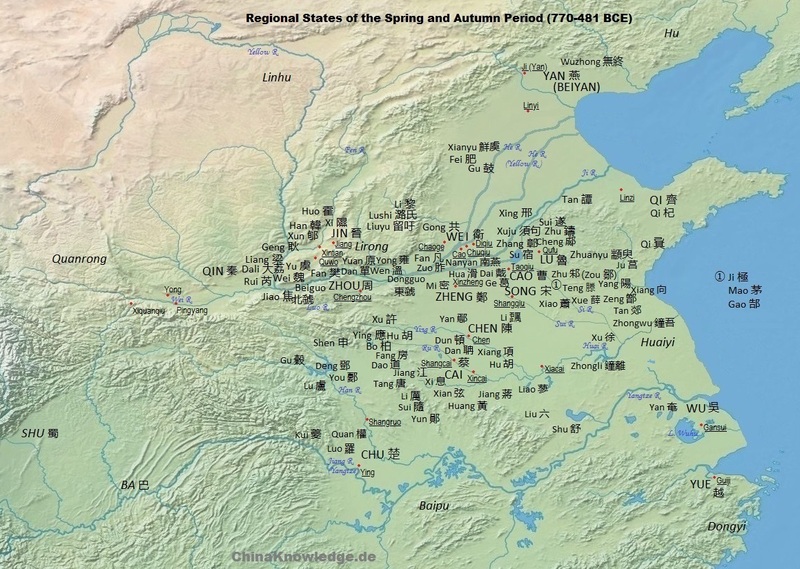 The kingdoms of Ba 巴 and Shu 蜀 were polities located in the modern province of Sichuan and flourished during the Eastern Zhou period 東周 (770-221 BCE). Ba was located around modern Chongqing 重慶, Shu around modern Chengdu 成都, Sichuan. Both states were separated by mountain ranges from the states of the Central Plain along the Yellow River and were not part of the orbit of the power of the kings of Zhou. Unlike the semi-"barbarian" states of Chu 楚 (modern Hubei), Wu 吳 (modern Jiangsu) and Yue 越 (modern Zhejiang) they did not participate in the political activities of the regional states of the Zhou empire. Map according to Tan Qixiang 谭其骧 (1987), Zhongguo lishi ditu ji 中国历史地图集. The states of Ba and Shu were located in the Sichuan Basin around today's Chongqing and Chengdu, respectively. Their culture was different from the regional states of the Zhou empire. The two kingdoms were conquered by Qin, the most western of the regional states. Possession of the Sichuan Basin promised direct access to the middle Yangtze Plain. Click to enlarge. The peoples settling in the regions of Ba and Shu were linguistically and culturally distinct to the Chinese peoples. They were historically referred to as the "hundred Pu" 百濮 and are known by the names of Cong 賨, Ju 苴, Gong 龔, Nu 奴, Rang 獽, Yi 夷, Yan 蜒, Dian 滇, Liao 僚 or Bo 僰, or, more generally, Man 蠻. The cultural diversity can most clearly be seen in the bronze vessels and objects unearthed in Sanxingdui 三星堆. Shapes, patterns and decorations have a clearly visible local character. In the writing system, other characters were used than in the regional states of central China, as can be seen in a few inscriptions on weapons and seals. Historiographical records were apparently not kept in both Ba and Shu so that the early history of these states is rather obscure and enclouded in mythology and legend. The states of Shu and Ba are also ranked among the polities supporting King Wu of Zhou 周武王 in the conquest of the Shang dynasty 商 (17th-11th cent. BCE). Zong Ji 宗姬 was therefore ennobled as viscount (zi 子) of Ba. During the Spring and Autumn period 春秋 (770-5th cent. BCE) the kingdom of Ba was mentioned concerning diplomatic relations. The kings of Chu also intermarried with the ruling house of Ba. The earlierst ruler of Shu was Can Cong 蠶叢. According to the book Huayang guo zhi 華陽國志, the earliest surviving chronicle of the region of Shu, he lived in a stone cavern at Mt. Min 岷山. He was buried in a stone coffin, which was a different custom from China proper, where nobles were buried in wooden coffins. One of his successors was Du Yu 杜宇, also known as Emperor Wang 望帝. His capital was in Piyi 郫邑 (modern Pixian 郫縣 near Chengdu). According to legend, he instructed his people in the art of agriculture and silk spinning. Emperor Wang's counsellor was Bie Ling 鱉靈, a person from the kingdom of Chu. He had a lot of experience with water conservation and helped amending flood and inundation that during that time afflicted the region of Shu. For these great merits, emperor Wang inherited the throne to Bie Ling in 666 BCE. Bie Ling was also called Kai Ming 開明, which became the family name of the later dynasty of Shu. Under the rule of the Kai Ming dynasty, Shu became a strong state that was even able to conquer some territory in the border region to the state of Qin 秦 in the north. The armies of Shu even attacked the kingdom of Chu in the east. This time of prosperity did not last for long, and the powerful state of Qin was able to take over initiative under King Hui(wen) 秦惠文王 (r. 338-311). In 316 he sent out an army commanded by Sima Cuo 司馬錯 and Zhang Yi 張儀 that annihilated the state of Shu and integrated it into the kingdom of Qin as the commandery of Shujun 蜀郡. A story in the Huayang guo zhi says that once King Hui of Qin met the king of Shu during a hunting campaign and presented him with a box of gold. Yet the king of Shu returned the jewels, and they transformed into mud. The entourage of the king of Qin explained this as an omen that Qin would once conquer the earth of Shu. Another time the king of Qin had produced five stone statues of cows that could transform into gold. The king of Shu asked to be given one stone cow, but it did not turn into gold. This was a new sign for King Hui that he would conquer the land of Shu. Another story goes that there was a man in Wudu 武都 who transformed into a beautiful girl. The king of Shu took her into his harem, but she did not feel comfortable in the watery land of Shu, and soon died. She was buried north of Chengdu in a place called Wudan 武擔. The king of Qin, knowing of the king of Shu's love for women, sent him five girls. On the way, they died, together with their attendants when the latter tried to dig out a large snake out of a hole, which caused a mountain to collapse. Later on, Qin in fact deployed its army and conquered the region of Shu. The nameless last king of Shu died on the White Deer Mountain 白鹿山. 316 Shu conquered by Qin 秦. Even less is known about the history of the state of Ba. According to legend it was founded by Lin Jun 廪君 who was elected chieftain over five native tribes. He was able to construct an earthen boat that did not sink and killed the god of salt 鹽神. Lin Jun transformed into a white tiger after his death, so that this animal was venerated in Ba. At the end of the 4th century BCE Ba was conquered by the armies of Chu and transformed into the commandery Wujun 巫郡. When Qin conquered the region, the commandery was renamed Bajun 巴郡. The conquest of the two states of Shu and Ba by Qin was important for the annihilation of the state of Chu downwards the courses of the rivers Han 漢 and Yangtze. c. 316 Ba conquered by Chu 楚, later by Qin 秦.
Meng Mo 蒙默 (1992). "Ba-Shu 巴蜀", in: Zhongguo da baike quanshu, Zhongguo lishi (Beijing/Shanghai: Zhongguo da baike quanshu chubanshe), Vol. 1, 14-15. Yuan Ke 袁珂, ed. (1985), Zhongguo shenhua chuanshuo cidian 中國神話傳說詞典 (Shanghai: Shanghai cishu chubanshe), 49, 405-406.